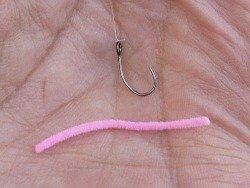 The Overhand Worm is the easiest fly in the world to tie. It takes only seconds. It uses only one material. You need only scissors or nippers. Aside from the hooks, the material required to tie well over 100 flies costs $2. If that wasn't enough, it is a very, very effective fly. I first introduced the Overhand Worm in my September 26, 2015 Trip Report. A couple days before that, I had told Morgan Lyle, author of the book simple flies, that I had developed the simplest fly that met the New York state definition of a fly. 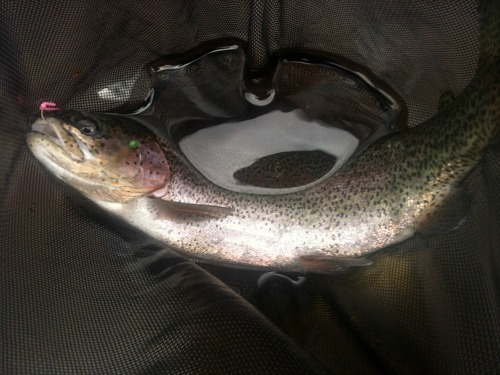 However, I had to test it first, and if it didn't catch any fish I'd deny I ever mentioned it. Boy does it catch fish! When I finally shared it with him and showed him the tying sequence, he said it was subversive. And it is, I suppose. Another good friend, a bit of a traditionalist, said something to the effect that he's a little disappointed that it works as well as it does. You see, there is this mystique about fly tying - time honored traditions, exotic, even unobtainable materials, exacting material placement and proportions. Dozens of insects and thousands of patterns. For someone just starting out it can be more than a little intimidating. The Overhand Worm cuts through all that. 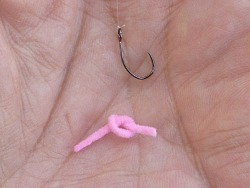 It makes tying a fly as simple as tying a knot - because that's all the Overhand Worm is - a knot. A knot of pink chenille, to be exact, through which you insert a hook and tighten. Done, fly tied, time to fish. 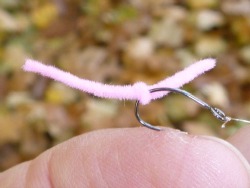 Seriously, it just doesn't get any easier than tying the Overhand Worm. 1. Cut a length of Ultra Chenille, Micro, Fl. Pink the same width as the card (do this in advance so you have them ready to go). The resulting "worm" is about 1.5" long. The only time I counted, I got 130 worms from one $2.00 card of chenille. 2. 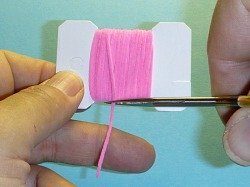 This photo shows all the materials you need: a hook and a pre-cut length of pink chenille. After trying several different hooks, I prefer the Wide-Eyed Hooks™. 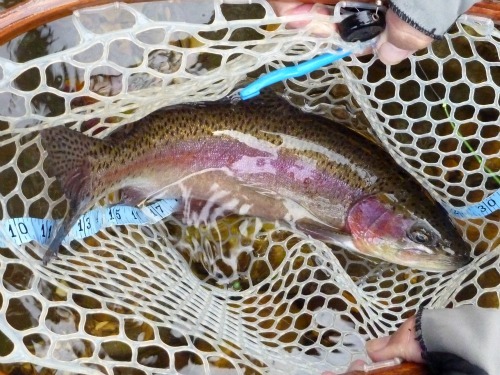 If you tie the Overhand Worm while on the stream rather than at home, tie the hook to the tippet first. 3. Tie an overhand knot in the chenille. 4. Hook the hook through the overhand knot. 5. Tighten the knot. TIGHT. You can slide it up to the hook eye if you like, but before long it will slide back down to the bend by itself. May as well just leave it at the bend. 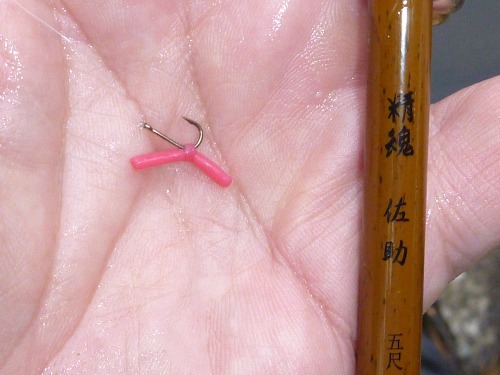 The reason I like the Wide-Eyed Hooks™ is that the shape of the bend keeps the knot of the worm away from the hook point, leaving plenty of room for a good hookset. 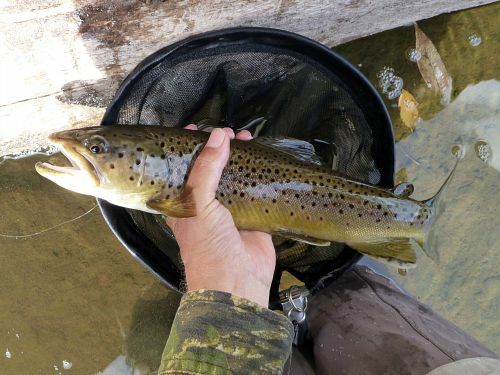 Another reason I like the Wide-Eyed Hooks™ is that even though they are barbless, they hold very well (at least until you get the fish into the net, then they often come out by themselves). This fly (and it is indeed a fly as defined in the New York fishing regulations) is not at all artistic, and certainly there is no mystique surrounding it. It boils fly tying down to the basics. It doesn't require thousands of dollars in materials or hundreds of dollars in tools. You don't have to take lessons. It will not win any contests or get you an invitation to join the Fly Tyers Guild. Orvis is not going to ask me if they can put it in their next catalog. What it will do, though, is catch fish. You can fish the Overhand Worm either with or without a single split shot 4-8" above it. Use a BB shot where the water is deep or the current is swift but in slower, shallower water no shot is needed. Thus, even the very light 9'8" Suntech Kurenai HM30R can fish the fly effectively. I've said many times that I'm not a "one fly" kind of guy. However, this fly does indeed tempt me. It is so very easy, and so very effective that I may end up fishing with this one fly most of the time. If you do a Google search on worm fishing, many if not most of the search results will be about fishing soft plastic worms for bass. Few lures are more effective. On my recent trip to Maine for smallmouth bass, I just had to try an Overhand Worm (tied on a size 14 Gamakatsu R10B) just to see if it would work. At a little over an inch long, it was about 1/4 the size of the plastic worms my buddy was fishing. Nonetheless, it caught my best bass of the trip, a 17 1/2" smallmouth. If you want to introduce a kid to fishing, you could do a lot worse than finding a lake or pond full of eager sunfish. 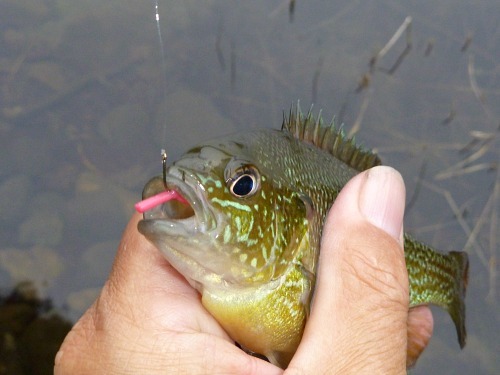 Anyone who fishes for sunfish with real worms knows they are masters at biting off the worm without ever getting the hook. Try a small version of the Overhand Worm! Trying two new things at once (a short Overhand Worm and also an Overhand Worm tied with Squirmy Wormie material) I caught a mess of sunfish in a few minutes just outside the cabin we stayed at in Maine. The overhand worm was no more than a 1/2" long, tied on a size 16 hook and was not too large for even small sunfish to take. The material can be stretched quite a bit to tighten the overhand knot, and it doesn't slide down the hook shank nearly as much as the chenille does. Tie it with short tag ends for sunfish and slightly longer ones for trout. After tying thousands upon thousands of flies I have fly tying burnout. I totally get the simple fly approach. Overhand knot worm. Love it! No weight, just soaked up chenille and the fish went crazy for it!!! Got about 20 gills and never lost the chenille. 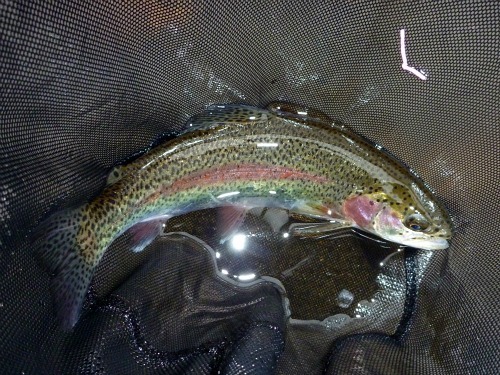 It was great to watch one Rainbow swim five feet back through a riffle and aggressively attack this fly, even though there was plenty of varied insect life around.